Arsenal’s pressing scheme and man-marking of Jorginho helped them secure a fast start. As they sat deeper, Chelsea got into more advanced positions but continued to demonstrate their problems breaking down deeper defenses. Arsenal then added a second goal, spurring a second half formation change from Emery that sealed the game. In some ways, Arsenal and Chelsea are in similar places at the moment. 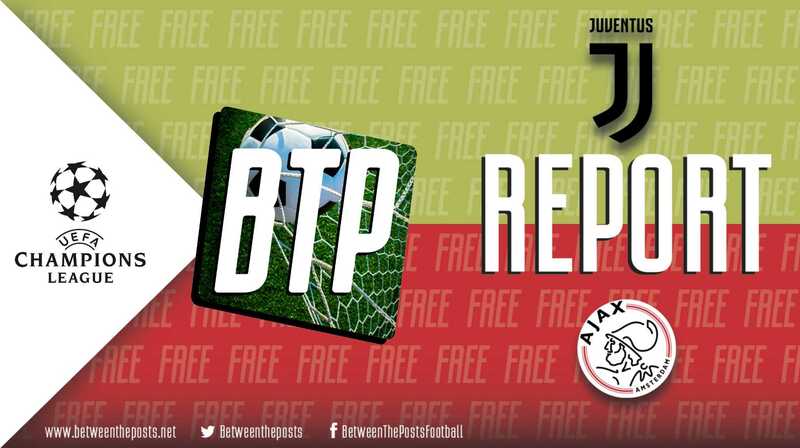 Both are desperate to end up in fourth place and are going through tough phases with managers who are trying to develop their own philosophies. That brought extra importance to this already intense London Derby. A win could have seen Chelsea go nine points clear of Arsenal with a victory. Alternatively, Arsenal could have put the pressure on with a win, narrowing the gap to just three points. To do this, Unai Emery decided to switch to a back four in the wake of Arsenal’s defeat at West Ham. Additionally, Shkodran Mustafi, Ainsley Maitland-Niles, and Alex Iwobi were replaced by Héctor Bellerín, Lucas Torreira, and Aaron Ramsey. Ramsey would feature as the attacking midfielder in a 4-4-2 diamond structure behind Alexandre Lacazette and Pierre-Emerick Aubameyang. Maurizio Sarri’s tactics were unchanged from last week’s win over Newcastle. This meant that Eden Hazard continued in a ‘false nine’ A striker that constantly drops deep and plays like a number ten. role in the usual 4-3-3 formation, amid speculation of the impending arrival of striker Gonzalo Higuaín. 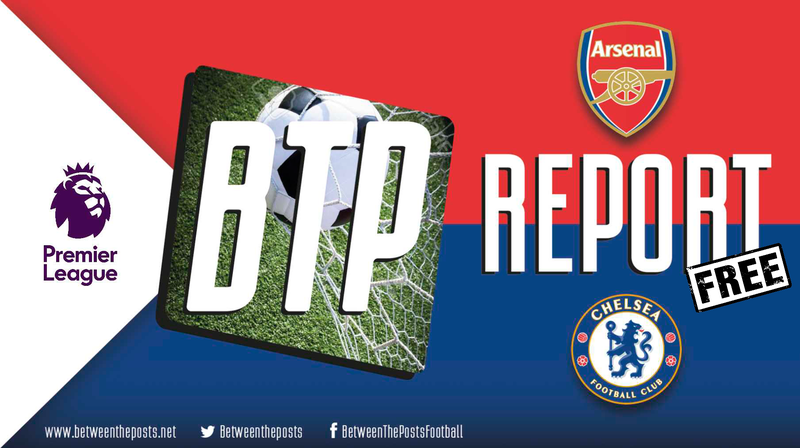 Arsenal’s pressing put Chelsea on the back foot straight from the opening minutes of the game. Chelsea have already struggled against a 4-4-2 diamond pressing system this season, as Tottenham Hotspur used it to good effect to beat the Blues in their earlier Premier League fixture. Arsenal copying Tottenham’s 4-4-2 diamond press to stifle Chelsea’s buildup. The 4-4-2 diamond’s natural shape allows for the playmaker at the tip of the diamond to man-mark the opponent’s defensive midfielder. As Dele Alli had done for Spurs, Aaron Ramsey kept track of Jorginho. Jorginho seems to struggle to find ways to free himself when man-marked, meaning Chelsea are forced to build through wide areas. In this game, they also faced two strikers up against their center-backs, meaning that it was harder for Antonio Rüdiger or David Luiz to progress the ball centrally. Due to this, the ball was often forced out to Chelsea’s fullbacks. Lucas Torreira and Mattéo Guendouzi would shift quite far into wide areas to pressure the ball, and Arsenal would attempt to squeeze this area through backwards pressing from Aubameyang and Lacazette. Arsenal’s spell of pressure helped them get their first goal just over ten minutes into the match. Hector Bellerín whipped in a cross from a short corner, which was brought under control thanks to a sublime touch from Lacazette. His second touch set him up to beat the goalkeeper from a difficult angle. Unsurprisingly, he scored and gave Arsenal a well-earned lead, as he is one of the best players in the world in these types of situations. Despite their struggles, Chelsea did manage to break through Arsenal’s pressure on a couple of occasions. After playing the ball to their fullbacks, they were sometimes able to find a route back in-field when the gaps between Arsenal’s midfielders became too big. However, even when they forced Arsenal back into an organized medium-low block A medium block refers to a team that retreats in their own half out of possession, generally only disrupting their opponents some way into their own half. A low block refers to a team that retreats deep in their own half out of possession, generally only disrupting their opponents around their own box., it became apparent that Chelsea lacked ideas to break their opponents down. Again, the play was funneled into wide areas by Arsenal’s midfield diamond, meaning Hazard struggled to receive the ball between the lines – which is where he can do the most damage. Chelsea were not completely helpless in wide areas, though, as they were able to easily find their fullbacks in space with switches of play. A pass from one side to the other. They then managed to work passing triangles in those areas, but found it hard to progress further. 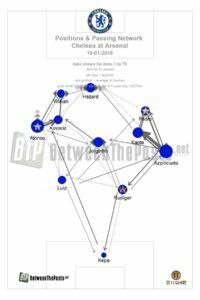 Chelsea’s strongest passing connections came in wide areas, with Jorginho being largely uninvolved. Given that the wings were their main option of attack, it might have helped to have had a more natural goal scoring presence to cross to. As it was, Arsenal were able to deal with any deliveries into the box with relative ease. Such problems are far from new for Chelsea this season. There is a reliance on Hazard to help create breakthroughs in advanced areas. In a game like this, where Hazard was unable to pick the ball up in threatening areas, it became an even bigger issue. Arsenal added a second goal shortly before half-time through a ‘header’ (on closer inspection, it hit his shoulder) from Laurent Koscielny. Chelsea continued knocking on the door in the second half in largely the same way they had in the first. They found the spaces on the wings but were limited to speculative crosses without a recognized goal scorer in the box. 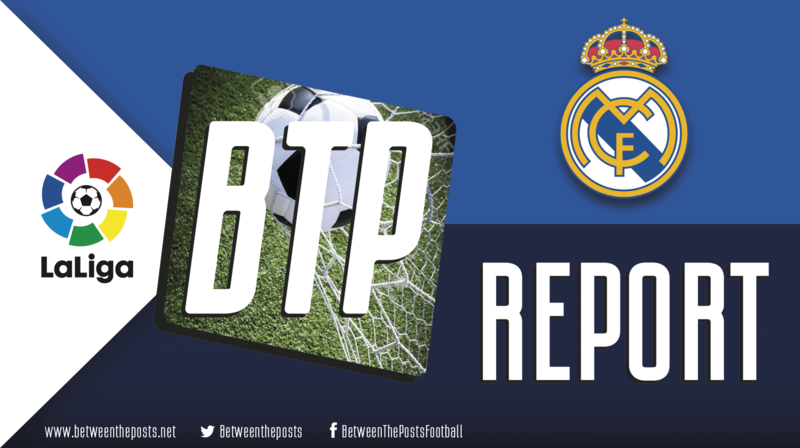 Around the seventieth minute, both coaches made changes. Sarri brought on Giroud for Willian, finally giving Chelsea, in theory, a bigger presence in the box. At the same time, Emery also made changes, including one that was enforced due an injury to Bellerín. Emery’s adjustments caused Arsenal to defend in a 4-4-1-1 structure, with Mohammed Elneny strangely playing behind the striker in order to keep tabs on Jorginho. Alex Iwobi replaced Lacazette to play on the left of midfield, while Torreira was shifted out to right midfield. Ainsley Maitland-Niles moved to right-back after Bellerín was subbed off. The wider midfield coverage offered by Arsenal’s 4-4-1-1 made it slightly harder for Chelsea to find space on the wings and cross to take advantage of Giroud’s aerial ability. Consequently, Arsenal were able to see out the game with their opponents having just one shot on goal. Chelsea created very little of note in the second half, especially after Emery changed to a 4-4-1-1 formation around the seventieth minute. 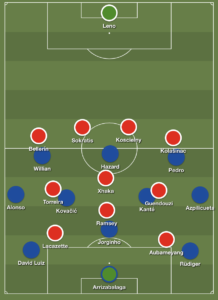 The 4-4-2 diamond is something that Emery has already used this season, and it turned out to be a good choice to counteract Chelsea’s tactics. The switch to a 4-4-1-1 shape worked out too, displaying Emery’s ability to switch systems in big games. From Chelsea’s point of view, the problems faced in this game are not new. Teams can easily mark Jorginho out of the buildup phase, while Chelsea struggle to create chances when the opposition gets numbers behind the ball. What will be the subject of discussion, though, is Sarri’s comments after the game, where he questioned the character of his players. They will need a reaction if they want to rescue their League Cup chances in the coming week, as they have to overturn a 1-0 deficit at home to Tottenham Hotspur.